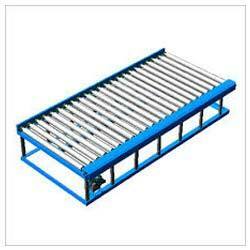 With rich industrial experience we are involved in offering an extensive range of Roller Conveyor. These are widely in many industries used for carrying and transporting of various items from place to another. Offered products are highly reckoned among our clients due to rigid construction and dimensional accuracy. We also test our products on various parameters before they are dispatched. Established in the year 2007, we, Girnar Engineers, are known for the purpose of manufacturing and supplying the best quality of Material Handling Equipment & Crushers. We offer a wide range of products such as Industrial Conveyors, Material Handling Elevators and Material Handling Feeders. The offered material handling equipment & crushers are known for their thermal stability, excellent load bearing capacity, compact design and high strength. Besides this, we are one of the prominent service providers of high quality Turkey Projects. Owing to their systematic execution, the offered turkey projects are highly appreciated among our clients. For the purpose of executing the offered projects within the assured time frame, we have appointed a team of skilled technicians and other support staff. Customer centric approach and transparency in all the business dealings are followed, in a zest to attain maximum customer approval. Total quality management at each stage of production, ensures that their qualities are never compromised at our end. We also assure accurate, safe and timely delivery of the offered material handling equipment & crushers at the clients’ end. The offered Material Handling Equipment & Crushers are highly demanded in coating and cement industries.